At the UNESCO Mobile Learning Week 2014 I sat on a panel titled Emerging Trends and New Technology – considered in the context of mobile learning. Below are the notes of the key points that I made. Note: The issue of Emerging Trends and New Technology begs the question: for who? For students in California, or for those in Kolkata? Developed country trends are very different from developing country trends. Most of the points below focus on the latter. Some of the ideas are drawn from the NMC Horizon Report 2013: K-12 Edition, for which I was on the advisory board. We keep being told that technology is going to transform centuries-old teaching paradigms, but traditional approaches seem to have real resilience and staying-power. Is this the moment of transformation? Why is this technological innovation different for education than previous moments (for example, the rise of television or the popularity of personal computers)? I don’t believe that technology is the single driver of education transformation, although it is certainly a key influencing factor. Education is under pressure to change because of a number of factors. Recently, a United Nations task team led by UNESCO produced a think piece on education and skills beyond 2015 – key points listed below. In all of these instances, mobile learning is well suited to supporting these changes. The think piece highlights that with the increase in access to information, and production of knowledge (both underpinned by technology), there is a questioning of the very notions of the authority of traditional bodies of knowledge controlled by legitimate educational institutions. Mobiles provide a new, and sometimes only, access channel to the internet for many people. The piece predicts there will be a shift away from teaching in a classroom-centred paradigm of education to an increased focus on learning, which happens informally throughout the day. A core feature of mobiles is that they support ‘anywhere, anytime’ learning. Because they are personal and always at hand, they are perfectly suited to support informal and contextual learning. Mobile has a role to play in bridging the formal and informal learning spaces. But this requires change in both spheres. More work is needed here. The NMC Horizon Report 2013: K-12 Edition report highlights this as a significant challenge. Learning that is time-dependent and location-dependent is not an option for everyone anymore. Again, anywhere, anytime learning speaks to the changing needs of people. The piece also predicts that there will be an increased blurring of the boundaries between learning, working and living. Mobiles already support skills development in a range of fields including agriculture and healthcare, and provide paying job opportunities for mobile-based ‘microwork’. In addition to education basics such as literacy and numeracy, the piece says, there will be a need for digital and information literacy, as well as critical thinking and online communication skills. These skills are increasingly important for entering the job market. With the guidance of teachers, mobiles provide a medium for developing these skills for millions of Africans who go online ‘mobile first’ or even ‘mobile-only’. Lastly, I see that the world outside the education institution is changing at a rapid rate, where technology underpins how people communicate, socialise, play, do business, pay for goods, or even farm. This change exerts a pressure on the static nature of education inside the schools walls. A relevant quote is from a forthcoming Prospects Journal edition on mobile learning: “Mobile learning is no longer an innovation within institutional learning but a reflection of the world in which institutional learning takes place,” Traxler & Vosloo, 2014. It is on the one-year horizon for the NMC Horizon Report (along with cloud computing). Devices are easy-to-use and pervasive. Device uptake is already huge, and will only grow. 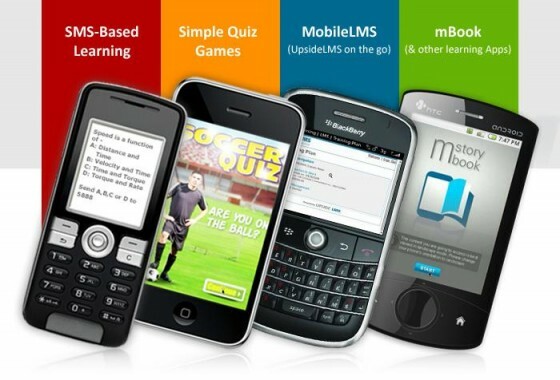 A huge amount of mobile apps and services bring education content to mobile devices. App development and programming is being taught in some schools. The NMC Horizon Report says that “Social media is changing the way people interact, present ideas and information, and communicate.” Social media has grown beyond anyone’s expectation. This is where (young) people are “living” online, and they connect via mobile. According to Flurry Analytics, overall app use in 2013 posted 115% year-over-year growth. The segment that showed the most dramatic growth in 2013 was Messaging (Social and Photo sharing included), with over 200% growth. From an education perspective, we must include socialness in learning experiences. Peer-to-peer support and connectivity, tutoring, knowledge sharing. We must also prepare young people on how to navigate this space. Teach and practice digital citizenship. Use social media in the classroom. Policy approach: change from Acceptable Use Policy (AUP) to Responsible Use Policy (RUP). Learning analytics is on the two- to three-year horizon for the NMC Horizon Report. Rise of big data and analytic techniques to make sense of it and to help us gain insights about student behaviour and learning. This has benefit for educators: can inform instructional practice in real time as well as aid in the design of curricula and platforms that personalise education. This has benefit for learners: can suggest resources to students and highlight study areas that need extra work. How do we create personal learning experiences even in groups of large classes? How do we cater to different learning styles (visual, text, etc.)? We must get this right on mobile – and we will as adaptive learning engines, more computational power and seamless learning (across multiple devices) become a reality. As Sir Michael Barber, Chief Education Advisor at Pearson says, there needs to be a shift in focus from the improvement of schools to the progress of individuals. Monitoring and enablement of learners, powerful combination of teachers and technology (not technology replacing teachers). But education institutions are not responding enough to the changes needed to curricula to recognise newly learned skills. The rise of MOOCs is an example. Distance education, underpinned by mobile access, will grow. A blended learning approach is still recommended. For further reading, see the UNESCO report on The Future of Mobile Learning (report | slides). Written by Steve Vosloo on April 1, 2014 in 2014 ICT4Edu Trends. Edtech is finally coming out of the eternal sunrise industry tag! best faculty, teacher & peer interaction, self practice (conventional elearning), Live scheduled program & learning analytics which can ultimately result in personalized learning paths. The current model needs to evolve and the completion rates need to improve but this seems to be the direction in which ultimately scalable yet effective models will emerge. While we experiment with all the new technologies/ gadgets the relevance of Moore’s transactional distance theory needs to be kept in mind – Structure, Dialgoue and Learner autonomy all three needs to be balanced for effective learning to happen over a distance (i.e. models where Teacher & Learners are not in the same physical place). the pervasive fear that many educators still possess when faced with using technology will continue to be a stumbling block until nonthreatening training is provided.